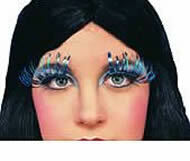 Long Metallic Tinsel Eyelashes. Available in Green, Gold, Blue, Silver, and Red. Tinsel Wig - Choose Your Color!